Set includes terminals for engines with early type (Socket) and late type (HEI "spark plug top") distributor caps. Multi angle boots and terminals factory installed on the spark plug end. MSD's Universal Spark Plug Wire Sets are available in your choice of black or red wire for a variety of applications and include a spark plug terminal and installed boot with one open end. 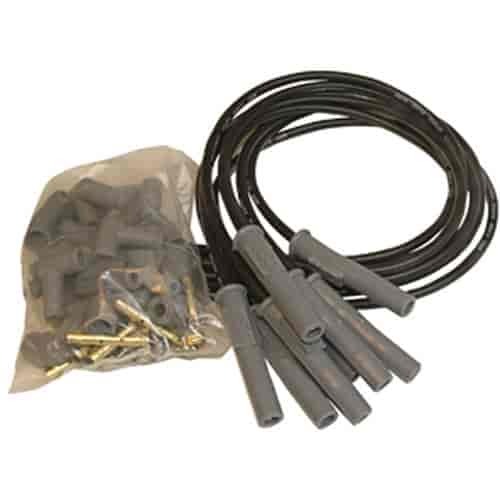 The set also includes distributor cap boots and terminals so the wire can cut to a specified length and installed with the supplied mini-stripper-crimper. MSD's Replacement Spark Plug Wires and Coil Wires are made with the same Super Conductor wire as their universal and pre-made sets, just longer than normal for custom tailoring when you need that extra length. Outer sleeves consist of silicone and synthetic material for a strong resistance to heat, abrasion, and tearing. Does MSD Ignition 31193 fit your vehicle? 31193 is rated 5.0 out of 5 by 2. Rated 5 out of 5 by R 64 from Looks great! I bought the wire set for my 64 Galaxie. Since I was able to cut the wires to give them a custom look, the installation looked great! Rated 5 out of 5 by ChevyT from Worked well Needed nonstock wires with a change to electron ignition and the length and boot choices worked well.